Special pricing for eligible students, parents and teachers. Bought it last night, I just clicked on the link and it said I was eligible, don't know how it considers my outlook email account as student, don't remember what I must have done?! Great price if you didn't want the 32GB card. I would be happy with 3 hours if I was holding it like a tablet. This is a full fat windows TABLET with FullHD at such a low price, I don't think I would complain. I heard the screen is very good and I intend to use it as digital photo pad. Does seem a good price, be interested to know how this runs.. Anybody owner like to comment? I bought a couple for work as a much cheaper alternative to the surface pro 4 I have admittedly this was from amazon on black friday. I was really surprised that it worked so well. Can be imaged to work on a networked version of Windows. The screen is really decent and weight wise felt a similar to the surface pro. The aspect ratio is a bit odd. Feels a bit like a cinema screen. For light office use and browsing this is fine. For the money if really is an amazing piece of kit. 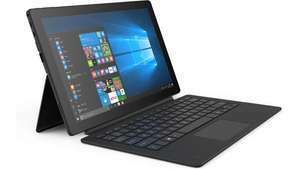 Would I rather have a surface pro or 4 of these? That's the question. Buy a new one each year. Also keep in mind the 64gb memory is enough if you make use of one drive. Steal at £180, the V64 with metal case was very heavy IMO, not sure what metal was used but Surface uses magnesium to get the weight down. Appreciate flancrusts input from the workplace scenario. Congratulations! You’re eligible for special student pricing. I'm eligible too! Not sure why. I don't need the FREE card so an extra £20 off is a bonus! Thank you. Congratulations! You’re eligible for special student pricing.I just logged …Congratulations! You’re eligible for special student pricing.I just logged in. I'm eligible too! Not sure why. I don't need the FREE card so an extra £20 …I'm eligible too! Not sure why. I don't need the FREE card so an extra £20 off is a bonus! Thank you. I just logged in to Microsoft, hit the "am I eligible" button and it said I was! They have an offer for a free 32gb SD card, plus you can get £30 cashback with Amex. So either this deal for £150 (if eligible) or £170 with sd card. For the money it's decent in that you get a large touchscreen device. Battery life is a compromise, and windows isn't my thing, but for the cash, very good. Hi, I've received mine. For the price it is good value (£149.99 inc Amex discount) especially screen (full hd, no dead pixels), ram (4gb) and storage (64gb) and Windows 10 64bit). Loads of Windows updates to install - took ages. However, support is lacking. I am having issues with the touchpad - I want to disable the gestures which keep accidentally going off. They are incredibly annoying - minimising windows, zooming etc just when using the touchpad normally to scroll and move the cursor. There isn't any driver software to customise these and Windows can't disable them either. If anyone knows how to disable certain gestures on this device please let me know. Otherwise I might end up returning it which would be a shame. EDIT: Went through the whole process starting with Quidco to activate cashback link and proceeded as normal to put Linx tablet into my basket and edited my payment details and bam, now ordered and waiting for delivery confirmation!.. Hoping I don't get disappointed too quickly like with the old Linx 10" model as it was great for media consumption but anything else it's a terrible thing to use!.. Seems like they want student verification for me when I went through the …Seems like they want student verification for me when I went through the checkout stage, shame really, would have liked to play around with this device... :(EDIT: Went through the whole process starting with Quidco to activate cashback link and proceeded as normal to put Linx tablet into my basket and edited my payment details and bam, now ordered and waiting for delivery confirmation!..Hoping I don't get disappointed too quickly like with the old Linx 10" model as it was great for media consumption but anything else it's a terrible thing to use!.. If you get it you will be lucky, I ordered on 8th december and it is still showing as pending, rang Microsoft several times and was told it’s being escalated still nothing. Shocking service. 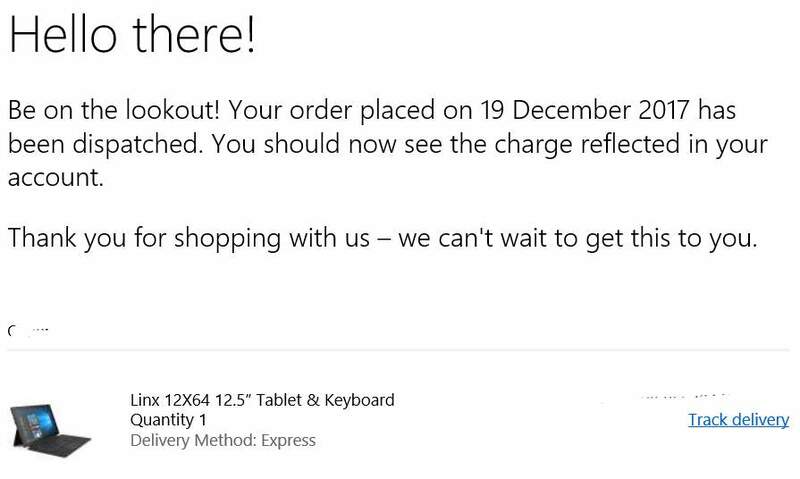 If you get it you will be lucky, I ordered on 8th december and it is still …If you get it you will be lucky, I ordered on 8th december and it is still showing as pending, rang Microsoft several times and was told it’s being escalated still nothing. Shocking service. Hi, I've received mine. For the price it is good value (£149.99 inc Amex …Hi, I've received mine. For the price it is good value (£149.99 inc Amex discount) especially screen (full hd, no dead pixels), ram (4gb) and storage (64gb) and Windows 10 64bit). Loads of Windows updates to install - took ages.However, support is lacking. I am having issues with the touchpad - I want to disable the gestures which keep accidentally going off. They are incredibly annoying - minimising windows, zooming etc just when using the touchpad normally to scroll and move the cursor. There isn't any driver software to customise these and Windows can't disable them either. If anyone knows how to disable certain gestures on this device please let me know. Otherwise I might end up returning it which would be a shame. Thanks. That is a Windows 10 feature following the update, no way to switch off other than WinReg. Check Google..
That is a Windows 10 feature following the update, no way to switch off …That is a Windows 10 feature following the update, no way to switch off other than WinReg. Check Google.. It's a bit more complicated than that. Windows 10 allows control of these gestures in the settings if it detects you have a 'precision touchpad'. But normally the driver utility would allow customisation of gestures such as Synaptics's utility. This device has neither a 'precision touchpad' nor a driver utility, just basic drivers for Windows to recognise the hardware. Linx support said they don't have any utility. I was hoping I could find a 3rd party app to manage it, no luck so far. EDIT: And, gues what!.. By surprise I just recieved my parcel... What a nice surprise indeed!.. Having the same issue with getting this delivered. Ordered 26th Dec, chased 29th but nothing, then two days later lied to it was dispatched on the 27th, Next day(3 Jan) I got a UPS acknowledgement and it moved to shipped but it still hasn't been collected on the 5th. Funny, they took my money on the 27th Dec! Worst service i have ever had anywhere and I deal with MS regularly as a business manager. Having the same issue with getting this delivered. Ordered 26th Dec, …Having the same issue with getting this delivered. Ordered 26th Dec, chased 29th but nothing, then two days later lied to it was dispatched on the 27th, Next day(3 Jan) I got a UPS acknowledgement and it moved to shipped but it still hasn't been collected on the 5th. Funny, they took my money on the 27th Dec!Worst service i have ever had anywhere and I deal with MS regularly as a business manager. Worst service ever, I got mine eventually but I had a problem with the keyboard not working after 3 days and there customer service is abroad, they couldn’t do anything for me. So I returned both on Tuesday and they haven’t refunded yet. I brought from very in the end who are much better.